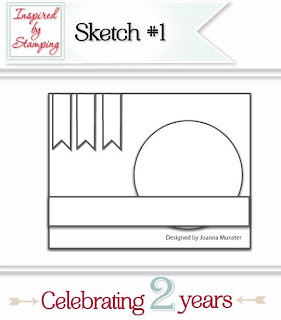 Today and for the next few days, we are celebrating Inspired by Stamping 2nd Birthday!! I am proud to be on this team and to be among some amazingly talented ladies. Joanna is an amazing leader/owner/artist/woman and friend. I can't say enough about her and I am over the moon excited to be on this journey with her and to celebrate her continually success with Inspired by Stamping. So today, we have some beautiful stamps being released this week and with this release we have some fun challenges for you to play along with!! I promise you, you will want to play along cause the prizes are crazy AMAZING!!! Let's get started with today's release. We are showcasing two new stamp sets today. Our first stamp set is Create A Cupcake, a 4×4 stamp set filled with 19 adorable images. You get to choose what cupcake wrapper and topper you would like plus adorable confetti to decorate! A fun filled set that will be perfect for your stamp collection! I have so many ideas for this stamp and I can't wait to create more beautiful cards. Do you do see the beautiful patterned paper? That is also beautiful paper created by Joanna, that are also part of this release. It's called Girl Birthday Bash Digital Paper. Is it not just delicious looking!?!?! 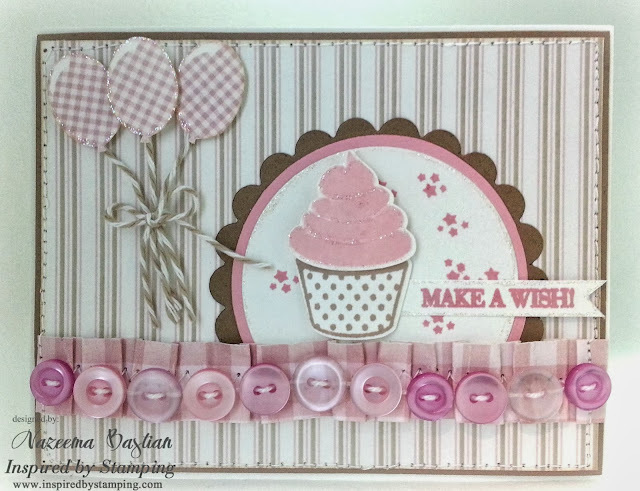 I had so much fun creating this card and I love all the buttons and glitter!!! I had to take a low light picture, just so that you can see the glitter on the card. Now, this card was created off of one of the sketches created by Joanna. This is set is SUPER fantastic!! 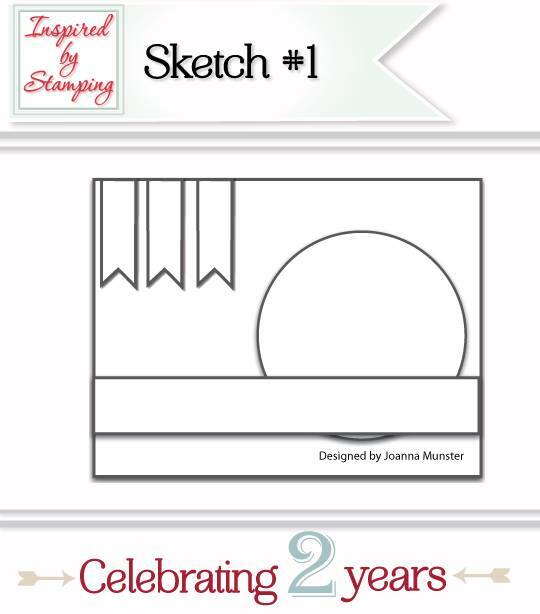 With Inspired by Stamping celebrating 2 years, we thought it would be fun create a stamp set with all our IBS favorite images from previous sets! This 4×4 contains a few of our favorites that we just know you will love! I just love the little banners that this set comes with! I stamped doilies from an older IBS stamp. Told you you would just LOVE this month's release!!! It really is an amazing release and I can't wait for you to see what the rest of the team have created for you!! You will just LOVE it all!!! · All stamp sets will be offered at a 10% discount. · All Ribbon and Flowers Marked Down – 25% - 50% off no coupon needed. · October 6th ~ 4 sketch challenges from our past IBSI challenge. Please email me directly if you have questions. Both are such beautiful cards!! LOVE the yummy cupcake on the first one, along with the lovely added buttons!! Beautiful use of colors on the second one! Great designs!! LOVE your card creations! The Make a Wish card is fabulous, with all those sweet buttons, and my wish would be to have those stamps, so pretty. Birthday Wishes card, with those doiles, and the cloud pp, is gorgeous! Congrats on 2 years!!! Woohoo! and many many more years to come! I have been a subscriber from nearly the beginning, and boy, I am constantly amazed at your genius, and talent in creating all the stamps, and digi papers! Kudos, and like I told Vicki on HER blog: Joanna is all that AND a bag of chips! I say that as a joke, but I sure MEAN IT! TFS, you creations and your talent Joanna! You ROCK, girlfriend!!! Fabulous cards, girlie! LOVE how you interpreted both sketches, those balloons are so cute tied with the twine, and you've used the boy paper to perfection. Great job! These are two fabulous cards!! I love the pleated paper & button trim on the first and the small stamped banner & rhinestone touch on the second...super!!! awesome cards my friend :) love the twine with the balloons!! awesome cards, calypso!!! AND HAPPY HAPPY HAPPY BIRTHDAY!!!! Gorgeous cards, Calypso - I love that row of buttons on the pink one. And hope you're having a fantastic birthday - Happy Day!! Happy Birthday! Have a lovely Day!! 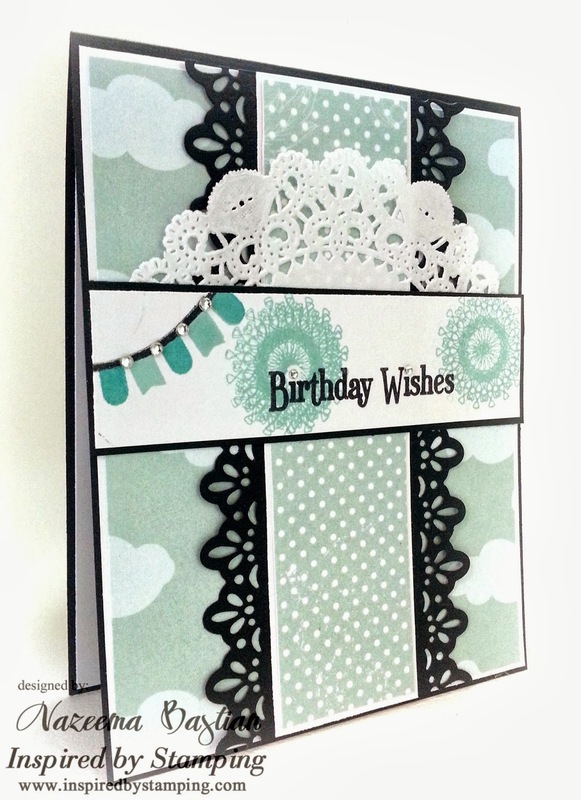 So fun that the card we 1st see on your blog is a b-day card! Fabulous btw love the row of buttons! Happy b-day and may your day be filled with happiness! AWE both cards are very cute!!!! HAPPY HAPPY BIRTHDAY TO YOU!!!!!!!!!!!!!!!!!! Wishing you a cheerful Birthday. Your creations are beautifully creative. Happy Birthday Calypso! Enjoy your special day!